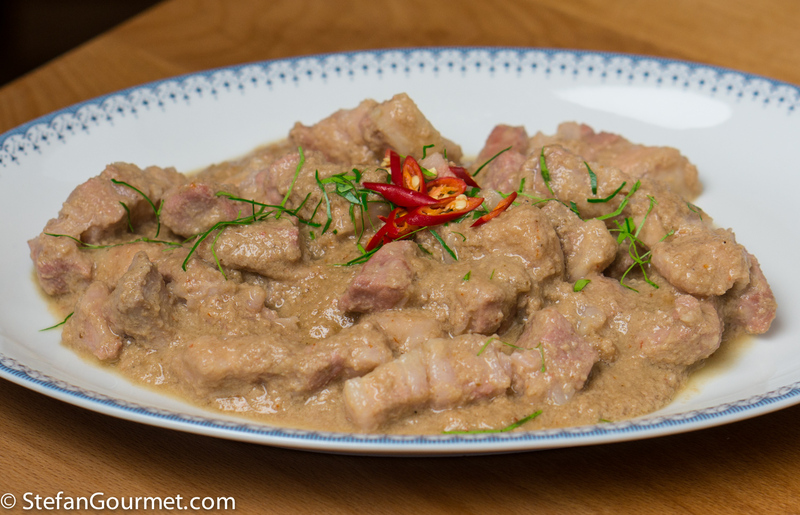 Panang is a Thai curry made with meat and red curry paste enriched with peanuts, cumin, and coriander. It does not contain vegetables, except that it is garnished with chiffonaded kaffir lime leaves and thinly sliced red chilli peppers. 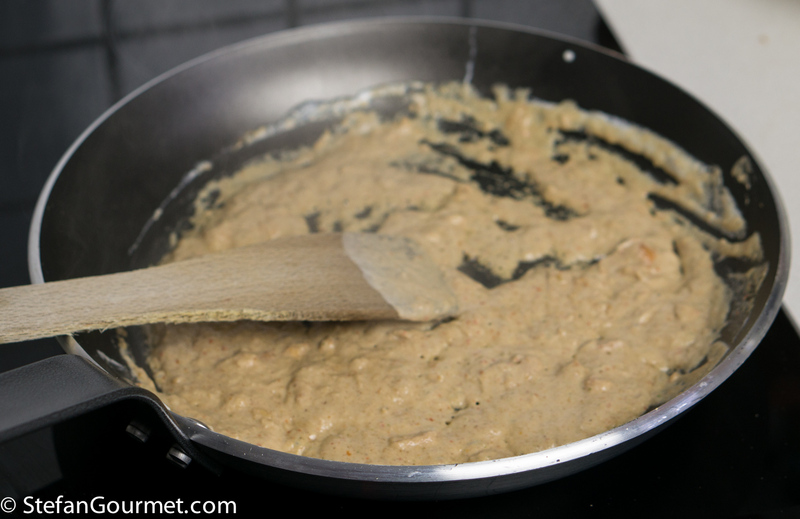 I’ve posted about Chicken Panang before, based on a recipe by the High Heel Gourmet. 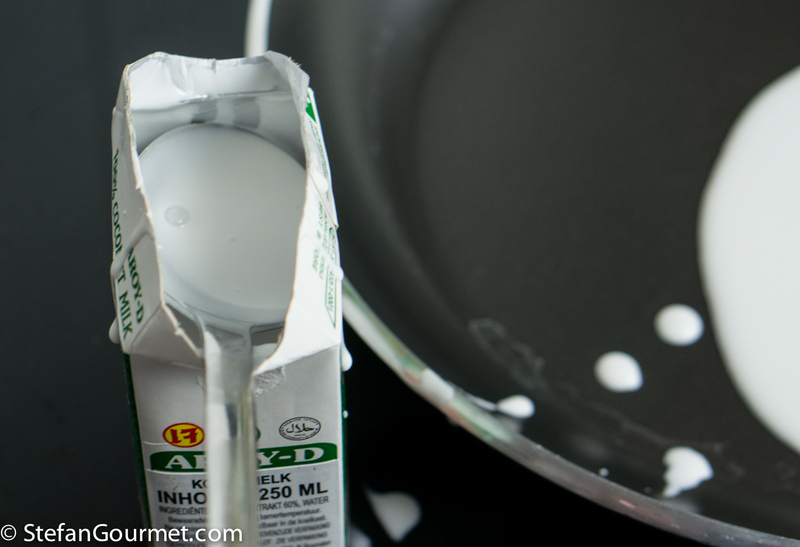 This time around, I thought it would be fun to experiment with thai curry sous-vide. 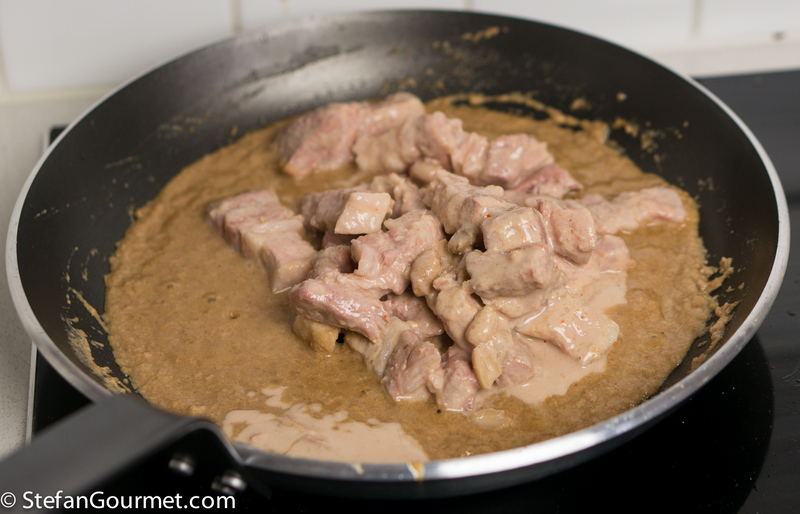 And so I made a Panang Curry with pork belly cooked sous-vide. The result was great: the pork belly was very tender and juicy, and the long cooking time allowed the curry flavor to penetrate into the meat. Cut 300 grams (.66 lb) pork belly into strips and season with salt. 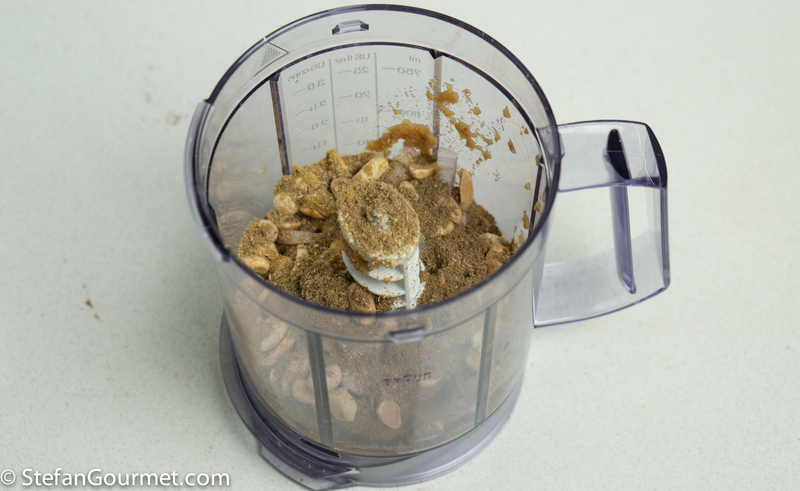 Combine 4 Tbsp Kaeng Kua Thai red curry paste with 1/2 tsp ground white pepper, 2 Tbsp roasted peanuts, 1 Tbsp minced shallots, 1/2 tsp ground cumin, and 1 tsp ground coriander in a blender (or mortar and pestle). 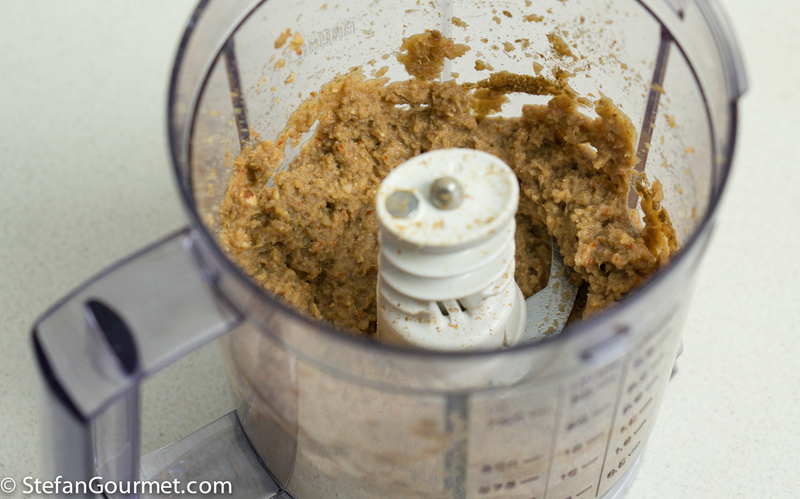 Process until the peanuts are ground and everything is well mixed. 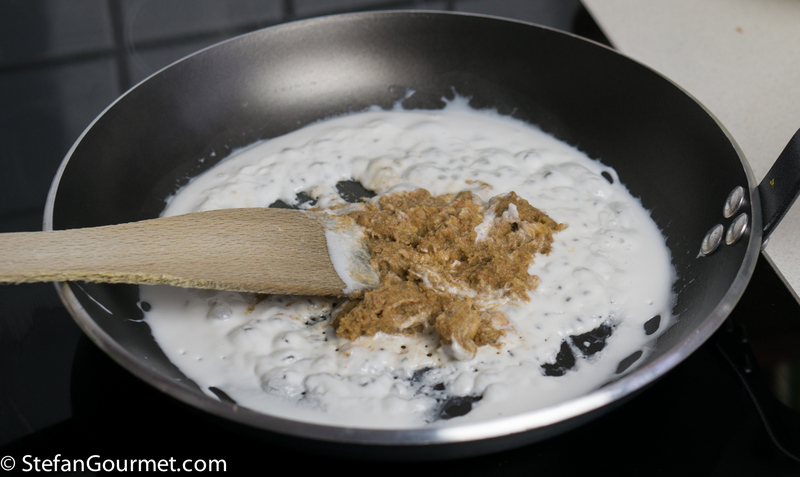 Scoop the coconut cream off the top of the coconut milk, into a wok or frying pan. 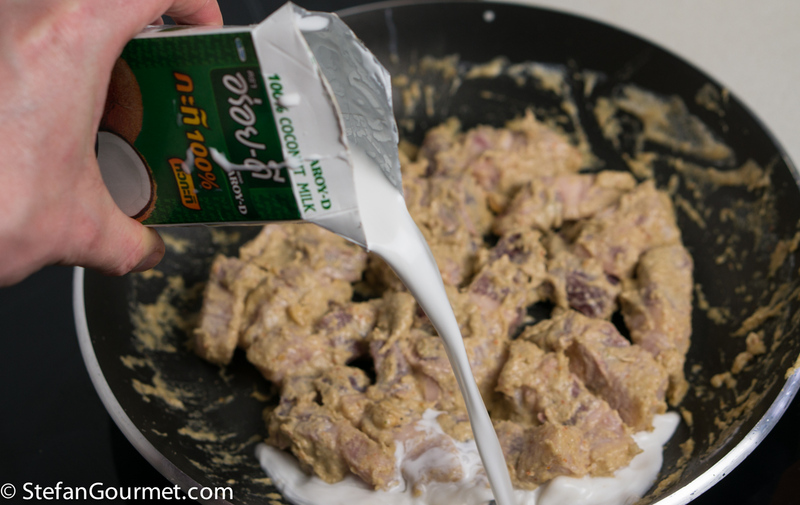 Heat the coconut cream, and then add the curry paste. 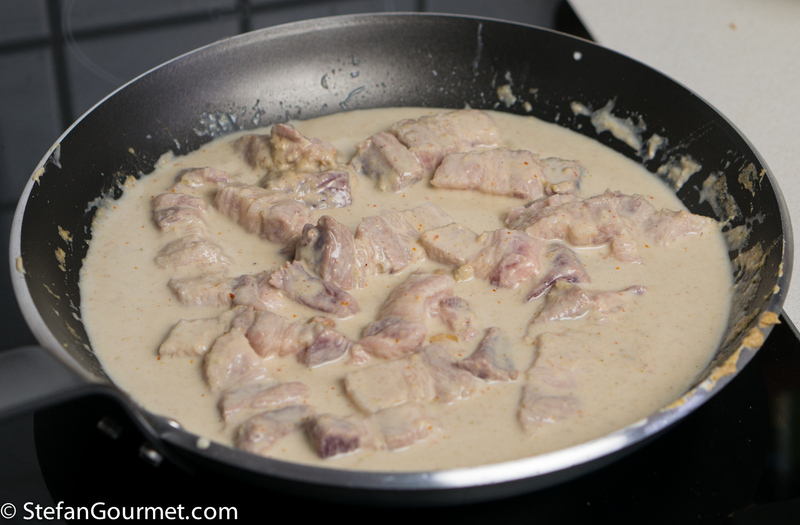 …and stir until the pork belly is coated by the curry paste. Then turn off the heat. …and stir. 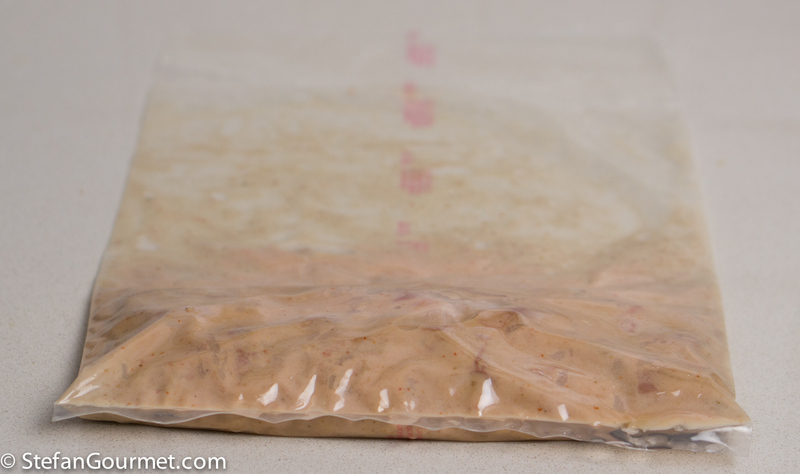 When using a chamber vacuum sealer, allow this mixture to cool to room temperature before proceeding (as the low pressure would otherwise make the mixture boil). Vacuum seal the contents of the wok or frying pan with a chamber vacuum sealer, or with a ziploc back and the water displacement method to seal it with as little air as possible. Cook sous-vide at 57°C/135°F for 48 hours. 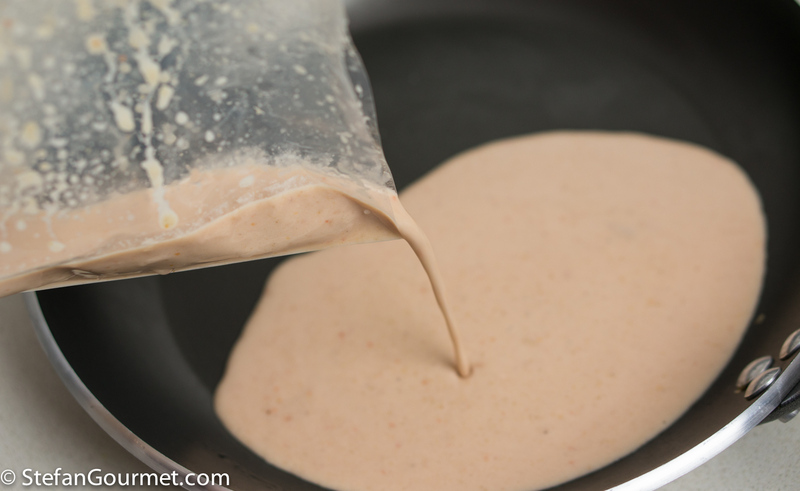 Pour the juices from the bag into a non-stick frying pan and reserve the meat. 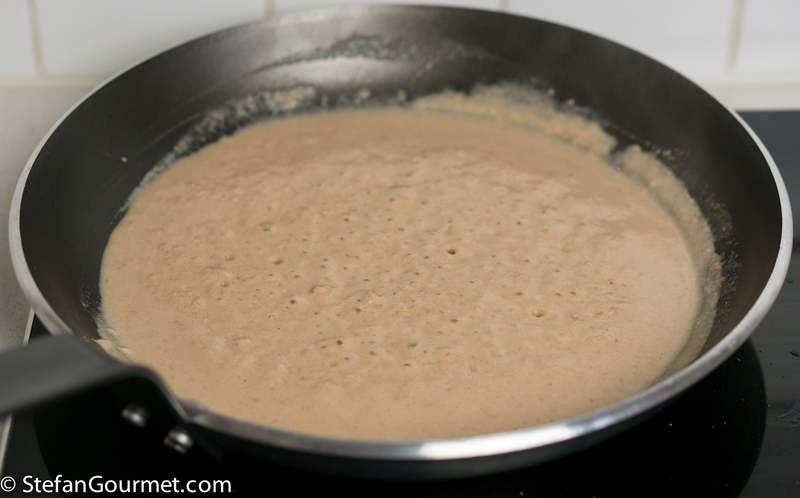 Bring to a boil, lower the heat, and cook over medium heat until the curry sauce has thickened to your liking, a couple of minutes. 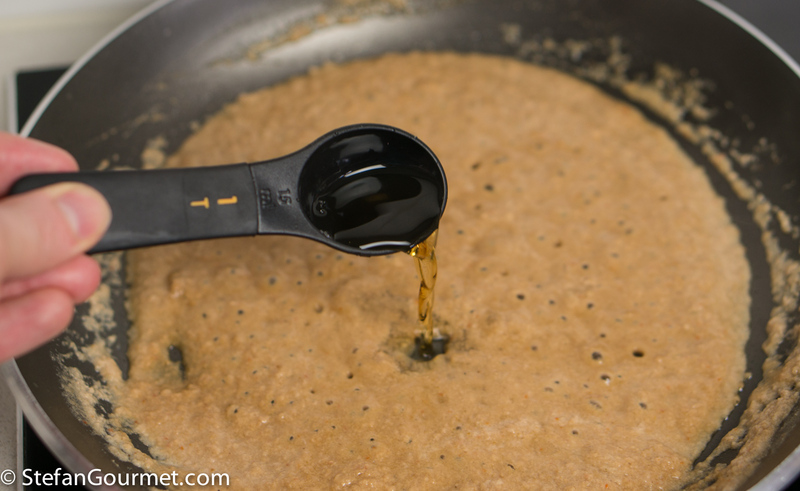 …and a tablespoon of fish sauce, and stir to incorporate. Add the pork belly and stir for a couple of minutes over low heat until heated through. Serve, garnished with thinly sliced chilli pepper and kaffir lime leaf chiffonade. This is great with a full-bodied Gewurztraminer. 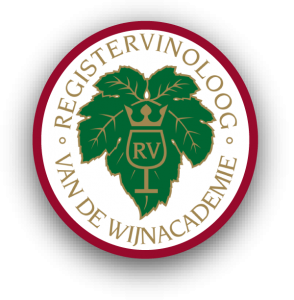 Depending on your preference, this can be either a Gewurztraminer from Alto Adige in Italy (which are very aromatic but dry) or an off-dry Gewurztraminer from Alsace. 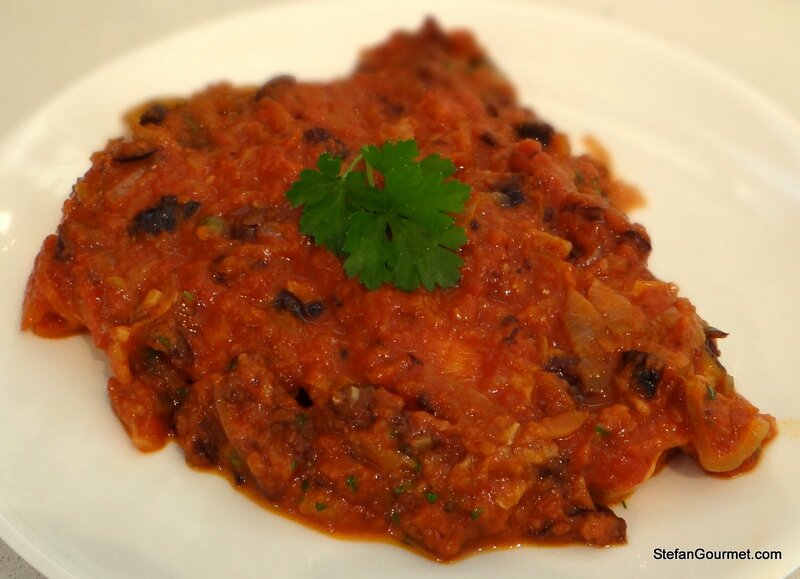 This Sicilian swordfish cooked in a savory tomato sauce would have been a perfect flashback for my previous post, which was also swordfish from Sicily but with breadcrumbs. Both versions are delicious and depend on not overcooking the swordfish. Nicely done. I had never considered using pork belly for curry but it sounds incredibly delicious. I am sure the meat was very tender, but I sure do like some crispy pork belly fat! The sauce sounds so very delicious. There is a post with crispy pork coming up. Thai curry is a simmering/braising dish, so crispy is not really part of the deal. That makes sense, Stefan. I’m looking forward to your crispy pork! Non ricordo quando verrai in Italia. Adesso, decisamente c’è troppo caldo per questi manicaretti! Sarò in Italia dal 24.8 al 12.9. Spero che farà meno caldo. Sarà un settembre dorato, ne sono certa! 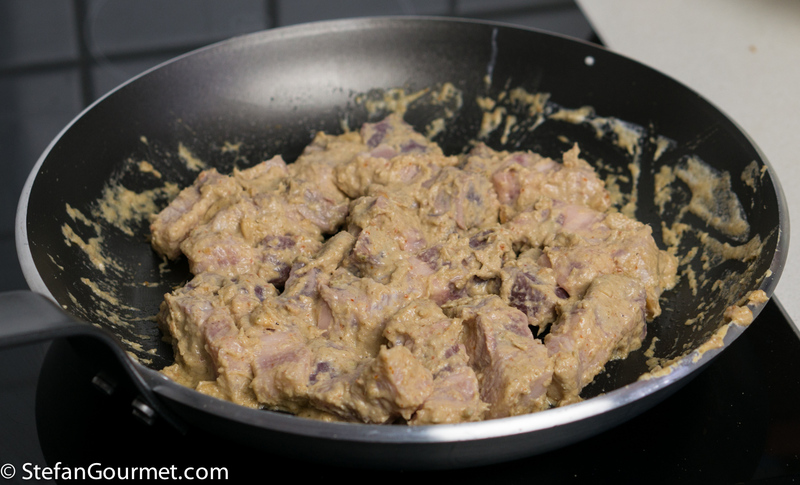 Lovely ingredients: shall use much leaner pork, make my own red paste, add your extras and have it on the table in about 2 1/2 hours – but then you knew I would 🙂 ! If I can translate from my sketchy knowledge of Italian, we may have special treats again in a matter of weeks 🙂 ! 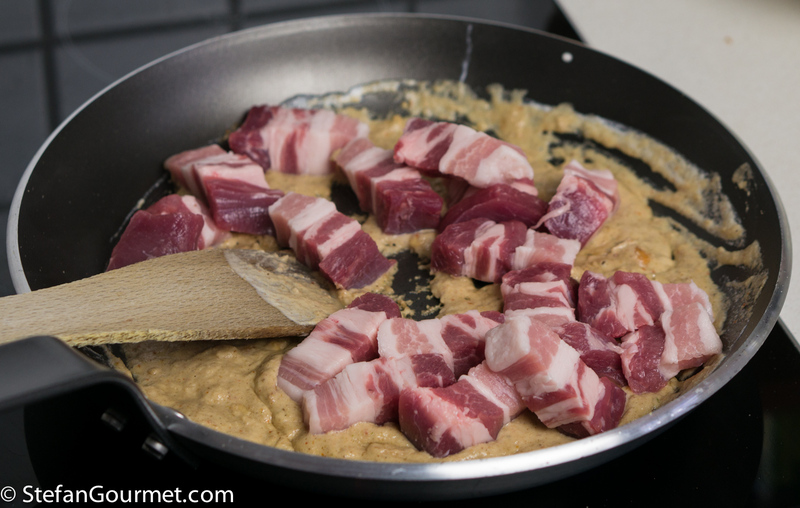 I have tried many different sous vide pork belly recipes – from here and other places. And never been disappointed. Predictably great meat with little effort. This curry is definitely a new thing to try. I am interested in your comment that the flavor of the curry penetrates the meat. Some recipes claim this but at the low temperatures of long sous vide I have never been convinced that it happened. Perhaps with the strong curry flavors it will be more distinguishable. That experiment was very convincing, however it may be that the behavior depends on what molecules are at play. Salt penetrates all the way, but if you marinade meat in red wine the color only penetrates a few millimeters per day (either refrigerator or sous-vide). I separated the meat from any sauce to check the taste. And yes – I would agree that the flavors do penetrate the meat. 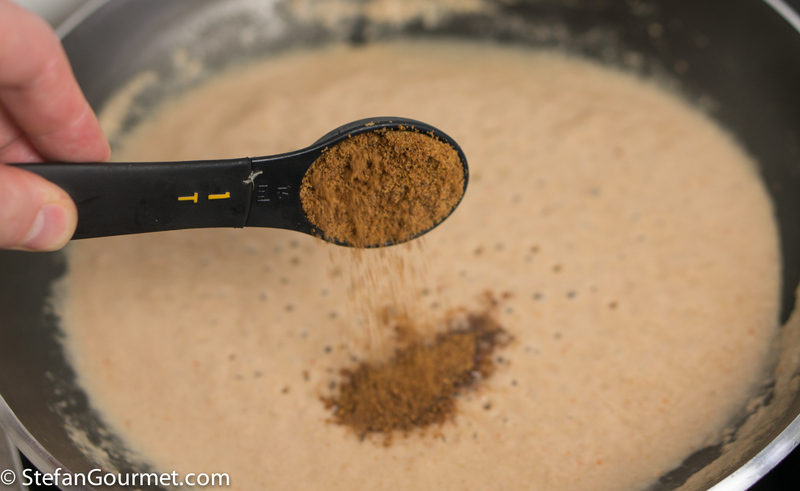 This is key – and I will be checking out why (or why not) in other recipes. Thanks for letting me know your results. I think that a long cooking time is key. 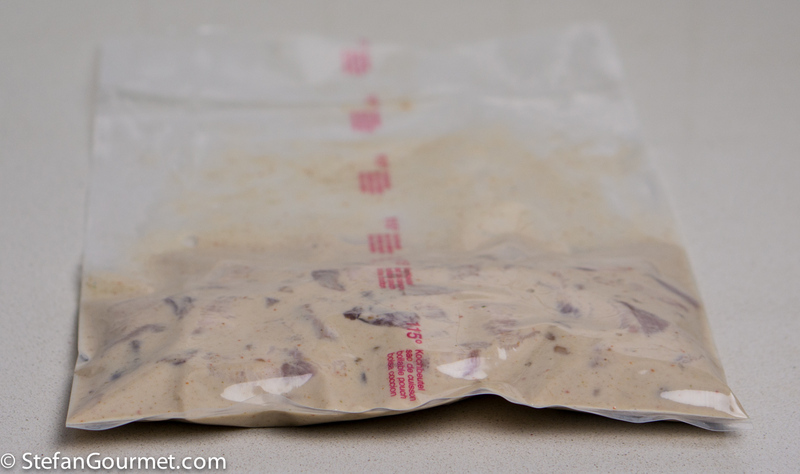 If only a few hours of sous-vide cooking is needed (like with rabbit), the marinading before cooking sous-vide is needed. oh my – Thai pork belly. Amazing! Omigod! This tears it: For my birthday I’m buying myself one of those immersion sous vide cookers. You will know where to go for times and temperatures 🙂 And I’m happy to help out with any questions you may have.